Touch surface for volume control and mute button to put Google Home’s microphones on standby. Integrated high-excursion speaker delivers crystal-clear highs and rich bass for hi-fi sound. Far-field microphones and industry-leading natural language processing. The Google Home has the Google Assistant built in. It’s your own personal Google, always ready to help. Optional base accessories include both fabric and metal with up to 6 different colors. The Google Assistant adds the power of Google Search, Maps, and more to your smart home. So you can ask Google for recipe conversions without putting down a measuring cup or adjust the temperature without leaving the kitchen. Even from across the room, when you say “Hey Google”, the far-field microphones hear you through the din. Google Home isn’t just a great way to control your smart home; you can also use it to control your media. Hosting a dinner party? Ask Google to turn on a playlist and adjust the lights while you greet arriving guests. When it’s time to liven up the party, your Google Assistant works with Chromecast so you can start streaming movies and music on your TV or speakers with just your voice. LED lights change to let you know it’s listening. Far-field microphones for hands-free use from across the room, even when it’s noisy. 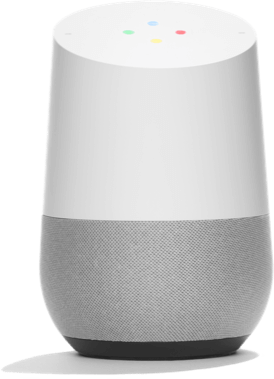 Google Home Mini has the Google Assistant built-in. It’s your own personal Google, always ready to help. Rear switch to turn the mic off. Side buttons for volume and playback controls. Integrated full-range speaker with 360 sound for music and voice feedback. With four hidden LED lights and a compact, clutter-free design, Google Home Mini puts smart home voice controls into any room while blending right in. Its touch surface resists everyday wear and tear, letting you discreetly adjust the volume, activate your Assistant, or control audio, timers, alarms and responses. So go ahead, make it your sous chef in the kitchen, your helper in the living room, or your tutor in the home office. 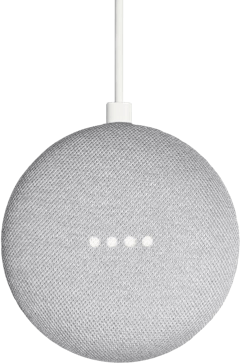 Compact and discreet, you can use Google Home Mini alone, or set up a few around the house to enjoy the power of Google everywhere. Since it integrates with Vivint Smart Home, you get voice control over every aspect of your smart home system. Welcome bedtime by setting the thermostat, locking the doors, and turning off the lights while you wind down—all with nothing but your voice. A smart home should remove tasks from your to-do list. That’s why Vivint Smart Home service includes professional installation. When you sign up with Vivint, we’ll send out Smart Home Pros installers to get your system set up, working seamlessly, and integrated with your Google Assistant. You have enough to worry about; let us handle the technical stuff.